Ten years ago today, Mark Zuckerberg gave birth to The Facebook and launched an online social revolution in his Harvard dorm room. We all know what happened next—thanks in no small part to an eight-time Academy Award-nominated film. With such humble beginnings, no one could have predicted the wild success (and cries of outrage) the site's many iterations would bring over the years. So in honor of Facebook's tenth birthday, travel with us back to simpler times as we take a look back at the site's biggest design changes in each year of its existence. Prepare yourself—nostalgia is about to hit hard. 2004: On February 4, The Facebook goes live on Harvard's campus before slowly opening itself to other colleges about a month later. 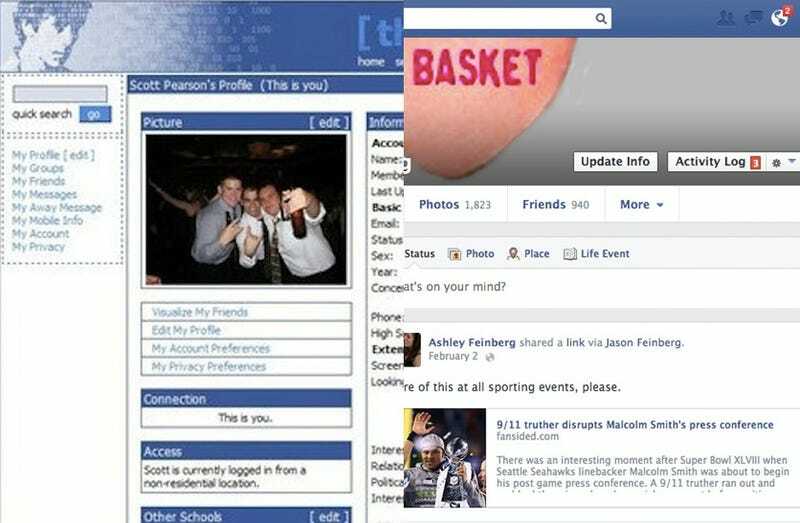 2005: Dropping the "the," Facebook.com expands to include high school students and introduces the Photos feature for the very first time. 2006: Facebook opens it doors to everybody. News Feed also makes its debut, spurring the first of what will soon be seemingly endless debates on privacy settings. 2007: Despite Facebook Beacon causing major privacy concerns, the site expands to include 50 million users by the end of the year. 2008: Facebook debuts an iPhone app, Facebook Chat, and long-awaited privacy controls for Friend Lists. 2009: Users can now "Like" things and are given their own personal Mini Feeds. 2010: Facebook gets rid of tabs, hits 500 million users, and launches Facebook places before killing it less than a year later. 2011: Facebook introduces its biggest changes yet with Timeline and the front page News Tickers. 2012: Facebook increases its focus on visual design with a new, larger photo viewer, but the addition of sponsored stories and Graph Search (once again) upsets users. 2013: The Facebook you know and love, with a Timeline that now exists in a much less confusing single column.